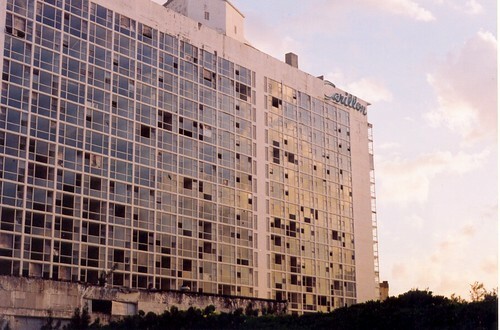 The Carillon was one of the premier hotels on Collins Avenue in Miami Beach during the early 1960s and is still lovingly remember by former visitors for its lavish nightlife productions and stage shows. A magnificent rendezvous designed with the flair and flourish befitting one of the world’s most luxurious night clubs. Its decor, influenced by the Far East, CLUB CARILLON is in itself a spectacle of beauty … and each evening when the house lights dim, you’ll be further entranced by the finest entertainment and dancing to Latin and American rhythms. CLUB CARILLON is your very own this glamorous night spot was designed primarily for our guests’ enjoyment. And this is only the beginning—you’ll love the unique TAMBOURINE LOUNGE for cocktails and conversation . . . Of course, our social staff has planned a complete program of day and night activities for both the young and young-in-heart. Yes, there’s fun a’plenty at the CARILLON … and still plenty of room just to relax, if that is your pleasure. Hi, i saw a 2006 picture of the Carillon on flickr. Looks like a perfect place to shoot, with this old Miami feeling still present; But the question is : what’s left today, is the builiding still standing ? Kudos for your blog, and if, btw, you have another places like this, full of nostalgia, please tell where they are as i leave for Miami in a few days! The original Tambourine Lounge is long gone, but the Carillon Hotel has just reopened after receiving a complete renovation by the Canyon Ranch people. I don’t know what has become of the Tambourine space, but I’ll be checking it out in the near future.